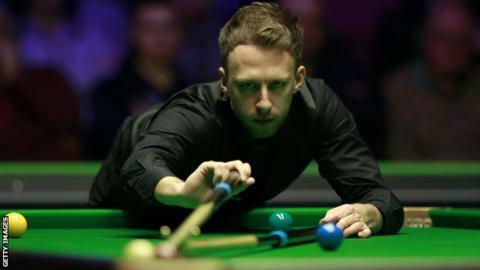 Judd Trump made light work of joining fellow former champions Ding Junhui and Neil Robertson in round two of the UK Championship on the opening day. World number five Trump, the 2011 winner, made a fine 128 on his way to a speedy 4-0 lead and closed out a 6-0 win over David Lilley with a 113 break. But Trump said he "didn't play well" and the scoreline was "flattering". "I made a couple of important clearances but I felt a bit rusty," the 29-year-old told BBC Sport. "It's a new tournament, a new venue, different conditions so you are just trying to get through. "I got a bit of luck here and there, but I don't want to be too harsh on myself and you don't want to be playing your best stuff at the start of the tournament." Kyren Wilson, the 26-year-old world number 11, also made swift progress, rattling in four breaks of 50 or more and finishing with a ton as he thrashed Hong Kong's Andy Lee 6-0. Wilson, who has yet to progress beyond the third round of the UK Championship, said: "It's the ideal start and great to get that first win out of the way. "I've not done well here but it's a big tournament and one I really want to do well in." In the afternoon session China's Ding, the 2005 and 2009 champion, was not at his best early on but made the most of a nervous display by Adam Stefanow to progress 6-1. World number 10 Robertson, also a two-time winner at the York Barbican, was a comfortable 6-2 victor against first-year professional Kishan Hirani. Englishman Jack Lisowski, continued his impressive recent form by cruising past China's Zhang Jiankang 6-1. The 27-year-old world number 17, who has reached at least the quarter-finals in five of the eight ranking tournaments so far this season, made breaks of 82, 120, 56, 53, 51 and 115. Elsewhere, 49-year-old former world champion Ken Doherty won six frames in a row as he came back from 2-0 down to beat China's Yuan Sijun 6-2. The Irishman could now face six-time UK Championship winner and defending champion Ronnie O'Sullivan, who plays Luke Simmonds on Thursday. "I am really looking forward to it," he said. "If it's Ronnie then I have nothing to lose. No one will give me a chance, but I can win and will just enjoy it anyway."